The village sign shows the remains of the Benedictine St Mary's Priory, which is situated close to the North Norfolk village. Today the nave of the much larger priory church has become the Church of Saint Mary and the Holy Cross and is still used as a place of worship. The remains of the priory are in the care of English Heritage. Binham has an entry in the Domesday Book of 1085. 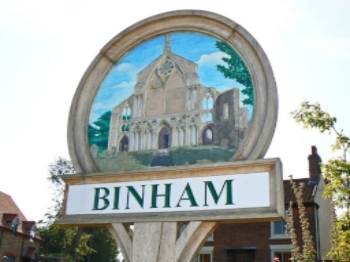 In the great book Binham is recorded by the names Benincham, and Bin(n)eham. The main landholder was Peter de Valognes.